In researching all the possibilities to supply HDTV to our Anchorage Camai Bed and Breakfast guests we chose to go with satellite reception. Earlier this year I began the process when I received an email from Direct TV. 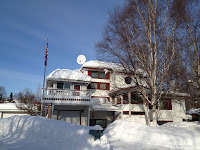 When I asked for the company’s current Alaskan customers, I was given several B&Bs who are not in Anchorage. I checked with them and they are all pleased with the service. The satellite was installed on Saturday and the wiring of all six TVs in the bed and breakfast suites was completed. The picture shows where the satellite is mounted on our very snowy roof. The two technicians were extremely professional and did an excellent job of mounting each TV’s receiver in a good location within the three suites. Each suite now has excellent reception and many channels to view including one of our favorite, The History Channel. Now our guests can view The Weather Channel for updates on our weather.